My family started buying Fair Trade products as soon as they hit the main-stream market, so I’ve grown up with stickered bananas, coffee, tea, chocolate, embracing the range of Fair Trade products as it grew. (I even sold them for a while, volunteering in a Fair Trade shop.) So imagine my excitement when the Big Fair Bake came round this year. 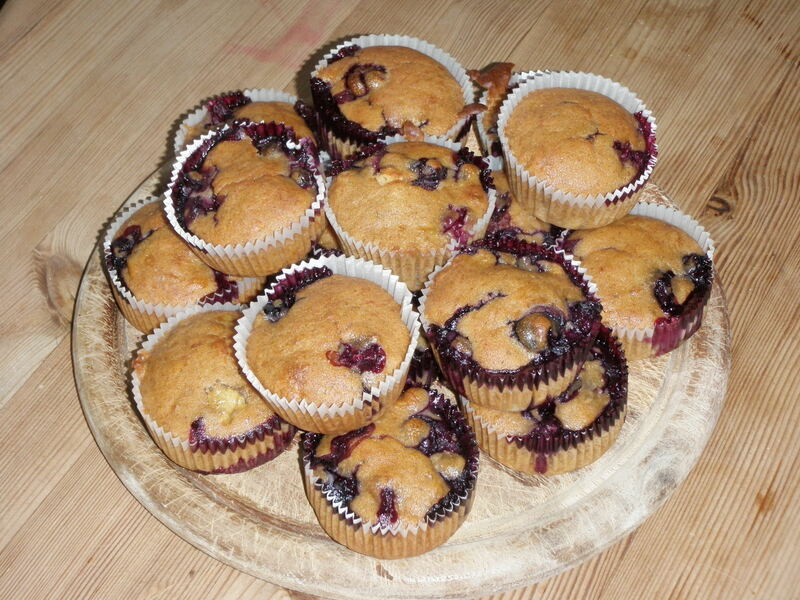 Their website offers plenty of brilliant recipes, under the catchy slogan ‘Who are you baking for?’ However, I preferred to make my extended family something after a recipe of my own, centring on classic Fair Trade bananas and organic blueberries. Pre-heat oven to 180ºC. Grease muffin tin(s), or line with paper cases. Mash bananas and place in a large bowl. Add sugar and mix thoroughly. Lightly beat eggs into the oil. Add to the banana mixture, stir until smooth. Mix flour, baking powder, salt and spices. Fold into banana mixture. Carefully spoon in the blueberries. Divide mixture over muffin cases. Bake for 30-40min. Remove when fork comes out clean.